While playtesting the game over the course of development, there were a few nagging things that I’ve finally got around to fixing. Each upgrade functioned as an on/off switch for a particular character stat. There was no room for focus or progression…once an upgrade was purchased, there was no way to invest in it again or boost its value. The upgrade window itself was limited to 5 upgrades per category, by design…meaning it would need to be overhauled if I wanted to add a 6th upgrade to any category. Upgrades themselves were a pain to implement, since each one required a full looping animation to be displayed beside its description. This looked nice but meant each upgrade took a lot of time to implement. 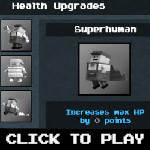 In the new system, each upgrade can be progressively boosted several times. So you can pour lots of upgrade points into a single upgrade type (for example, firearm damage or walk speed, etc), or spread your upgrade points out between many different upgrades. This allows for much more precise character customization. The new system looks similar to the crafting help panel, and an unlimited number of upgrades can exist for each category. In the new system, upgrades are displayed as unique icons, rather than animations, so adding new upgrades is very easy and requires minimal artwork. Overall, the new system looks and functions much better than the old system. Also, there are 54 different upgrade types and about 275 total upgrade possibilities….in contrast to the 50 total upgrades of the old system. So I think the new system will allow players to have a lot more fun testing different character builds, and feeling the satisfaction of progressively upgrading various character proficiencies over time. Secondly, vehicles have been completely re-written. Unfortunately, with the release of Unity 5, WheelColliders changed in a drastic manner. I previously relied on them for all vehicular motion in the game, and since I could never get the new WheelColliders to function the way I needed them to…I was on the brink of removing driveable vehicles from the game entirely. But while digging around with alternative solutions, I discovered some legacy Raycast-wheel scripts written by an absentee Unity developer named Forest Johnson. I was able to modify his code in such a way that vehicles are now working again, using Raycasts instead of WheelColliders to simulate proper tire friction and velocity. The benefit of this system is that it won’t be made obsolete if Unity devs change the inner workings of WheelColliders again, and I’ve found it to be more stable than the old WheelColliders, because I have full control over all friction settings and am no longer at the mercy of finicky WheelCollider physics. While re-doing the vehicle motion system, I also implemented the fuel system for motorized vehicles. 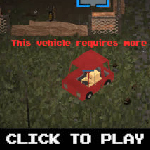 Any vehicle with a motor now requires fuel before it becomes driveable. Each motorized vehicles has a special fuel slot in its GUI interface, allowing players to re-fuel vehicles with ease. Fuel can be purchased from NPCs, retrieved from care packages, or distilled manually from toxic sludge in the craftable chemistry lab. Finally, along with hundreds of other little tweaks and changes that I won’t list here, I took a second look at the item perk system previously implemented into the game, and improved it. 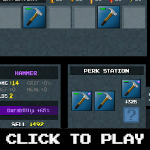 It used to function similar to the old character upgrade system….once you perked an item, that was it…you could never improve the value of its perk and it was set in stone. The new system, however, is progressive. Items can be continually combined over and over to increase the value of the resulting perks. So instead of two weapons combining to make a perked weapon with a static perk value, you can combine weapons over and over to progressively increase the value of the resulting perk. This means that just because you come across multiple instances of a particular weapon, that doesn’t mean those instances are redundant. Having this progressive perking system means players won’t feel disappointed if they have a large number of the same weapon type, because those can all be combined to create a super powerful weapon with maxed out perks. oh, man! Can’t wait for this game!! Great work Tyson! The hype is real! Thanks for taking time to put up an update! Awesome update, can’t wait for more. I’ve been following you since September and I am impressed by your work. Just release it already! I’ve been waiting for 3 years. But I wil wait forever. Powered by WordPress v 3.4.2. Page in 0.150 seconds.